So a few weeks ago I found myself off from work on a Wednesday with nothing to do. I work at a rural and isolated English village just outside of Daegu. We literally live in the mountains somewhere which makes getting off campus quite the challenge. Ya’ll, I’m telling you, if we were to get murdered, no one would hear the screams. Or smell the rotting flesh. Good thing Korea is so safe! Anywho, so when presented with an off day or some free time I like to get out and into the city as much as possible. So, instead of sleeping late in bed I got myself together and made it down to the shuttle bus that goes into the city. 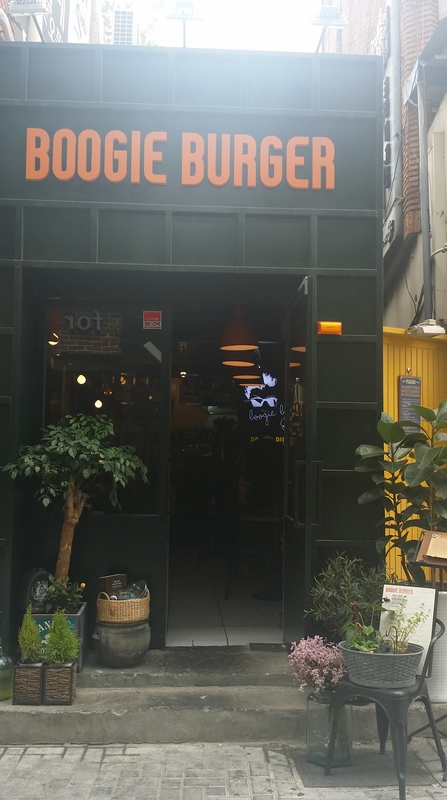 Once in the city I went to my favorite tea shop right near Hyundai Department Store in downtown Daegu. I spent the next hour or so tapping away on my computer putting the finishing touches on the indiegogo campaign for my upcoming web series, Black Girl in the ROK. After a while hunger set in and I set out in search of something to eat. You know, I’m a creature of habit so I tend to hang out in the same downtown area and usually I go to the same stores and restaurants. But as you can guess, that wash, rinse, and repeat way of doing things can get old real quick. I thought about going to my favorite Italian restaurant but when I stopped to think about it, I didn’t really even want Italian. I kind of wanted some American food. Maybe some chicken wings or even a good old fashion burger. Then I remembered that there was a new burger place that just opened called Boogie Burger. I’d walked passed it a few times but never really had the urge to try it until that day. I’d seen some really great reviews of the place online so how bad could it be? Upon entering I was the only one there which was kind of great considering how small it was. There were like 8 or so tables, the true definition of a burger joint. After scanning the menu I decided on the mushroom burger, because I love me some mushrooms, along with a side of cheese fries.I scanned the walls looking at pictures of various famous soul singers throughout history as a live recording of Stevie Wonder’s As played in the background. It really is a cute little place. After about twenty minutes or so my meal came out and upon first getting it I was a bit disappointed. It was a burger with two big old breaded mushrooms inside. I was happy that the mushrooms weren’t just the regular old sauteed kind but I thought beef was apart of the sandwich as well. I thought about sending it back to the kitchen briefly but then I said what the hell and decided to eat it anyway. I could it beef anytime. 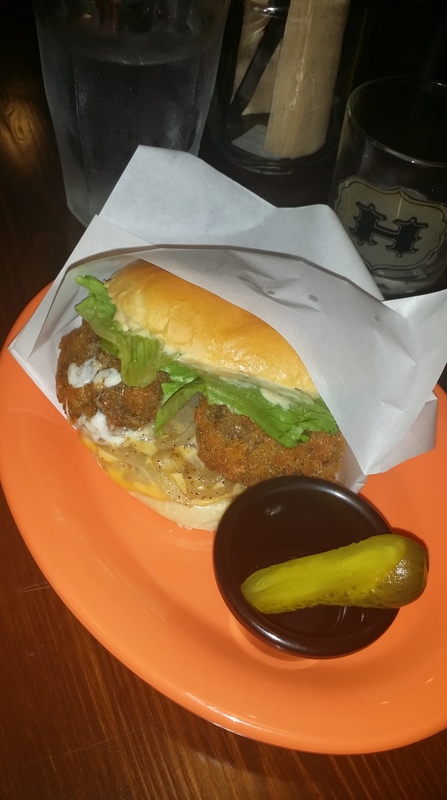 As I bit into my burger my taste buds were delighted with not only the taste of crispy mushroom but…beef! Much to my surprise the beef was hiding UNDER the mushroom. I chased my mushroom-beef burger with bites of the cheese fries. They were pretty good. 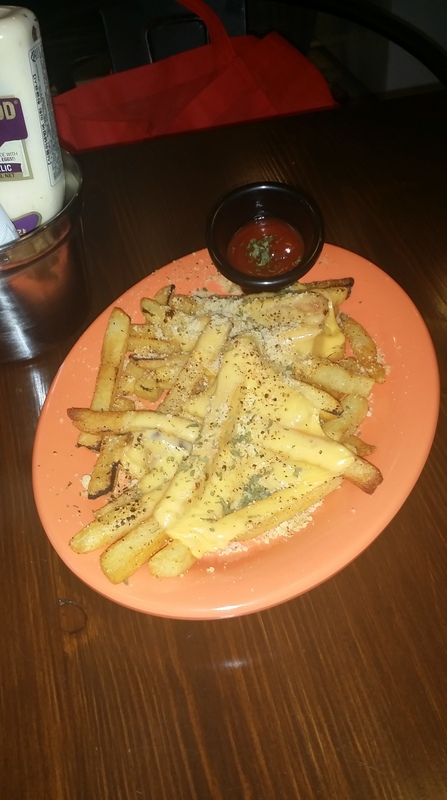 Even though the fries were just from a bag in the freezer, the cheese sauce had a little kick to it. I think I tasted the faintest flavor of some type of American style hot sauce. Let me tell you, after living in a place where American flavors and aromas are scarce, when you find something that reminds you of home, you run with it! All in all, I enjoyed my meal. It was a little pricey, the burger plus the fries ran me around 15,000 won. I’m off soda(mostly) so I just drank the free water but if you did want a soda, your meal could easily end up being almost 20,000 won. Most everything is al a carte. For example the bacon burger didn’t come with onion, so if you want onion you have to pay an extra 500 won. Fries are also on the side too. But it was nice that they had other side dishes like mac and cheese. I might have to go back just for the mac and cheese. God, I miss mac and cheese. 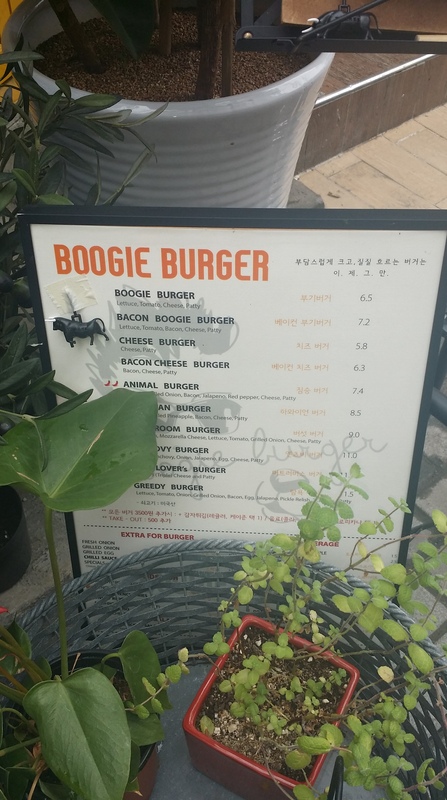 So I have to say if you are ever in Daegu and you’re looking for a good American style burger that is a step up from fast food chain quality, I recommend trying out Boogie Burger. Sure, your wallet will be a little lighter, but you’ll leave satisfied. african american in koreaamerican and abroadblack girl in the rokblack in koreaboogie burgerboogie burger koreadaegudaegu koreakorearestaurant review.